On Saturday we decided we would make a stew out of a couple of beef shanks we had and then save the stew until Sunday to eat. That did not happen. We ate it right away. First we browned the shanks and afterward cut them into smaller pieces. This technique is much quicker and easier than browning a bunch of smaller pieces! I sauteed up onions and mushrooms while John cut up the meat. We layered the the rest of the vegetables into the pot, put the meat on top, and added liquid (a can of diced tomatoes, a cup of red wine, and some beef stock) until I could see the liquid but it was not covering the meat. Then we selected pressure cook for 16 minutes. The pressure went down on its own. Best part of the stew? The shank bones we added that still had marrow in them. We spread it on bread. Yum. All in all an easy, quick dish! 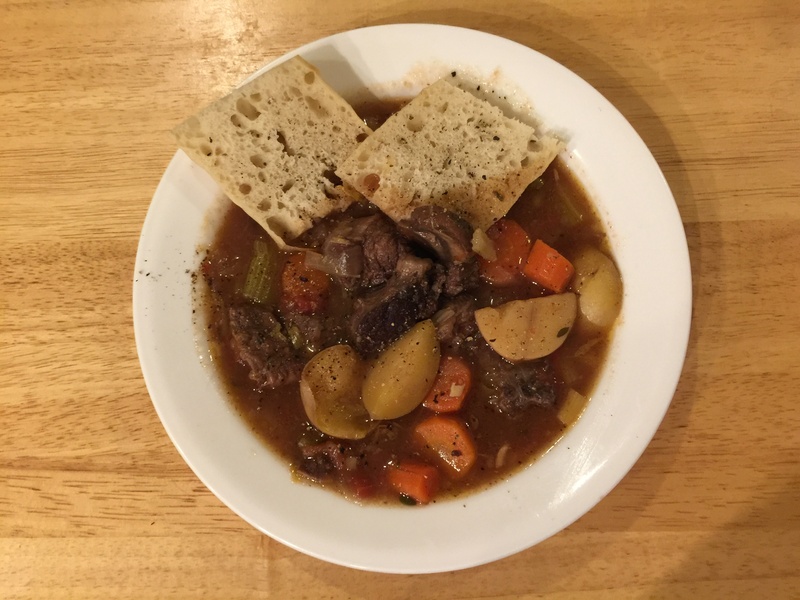 This entry was posted in Beef, Kitchen tips, Vegetables and tagged Beef shanks, carrots, mushrooms, Onions, potatoes, stew. Bookmark the permalink.